Wednesday January 30, 2019-National Assembly Majority Leader, Aden Duale, has admitted that Deputy President William Ruto is facing tough times ahead of the 2022 General Election in which he plans to vie for President on Jubilee Party ticket. Speaking during an interview, Duale, who is also the Garissa lawmaker, said that the DP should not expect a smooth ride in his 2022 Presidential bid. He added that the party could have other presidential hopefuls for the seat, and Ruto must prepare for primaries with others likely to emerge with time. He maintained that Ruto should not expect any favour from the party on the same despite his placement as the party Deputy Leader. "When the time comes and there are other candidates, then Ruto and others will be subjected to the primaries," said Duale. "Whatever was said in the past about the party supporting him in 2022 doesn't matter if others show interest in the seat. However, he is our only candidate until now," he added. 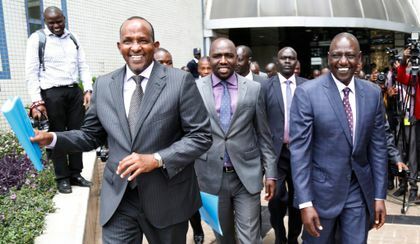 Duale was echoing the sentiments by Jubilee Party Secretary General, Raphael Tuju, who said that Ruto will face other candidates for the 2022 Jubilee ticket.